Back when we still had a few veterans of World War I living in Sanilac County the director of the county’s Veteran’s Affairs office decided to hold a special dinner to honor this select group of American Heros. When I started digging into the story of Admiral McCrea, I learned that this man played an outstanding role in American history. He had served as an aide to President Franklin D. Roosevelt, was given command of the Battleship Iowa during World War II, and was in command of that ship when it carried Roosevelt and some of the nation’s key military leadership on a secret mission to Malta for a famous meeting with Churchill and Stalin in 1943. 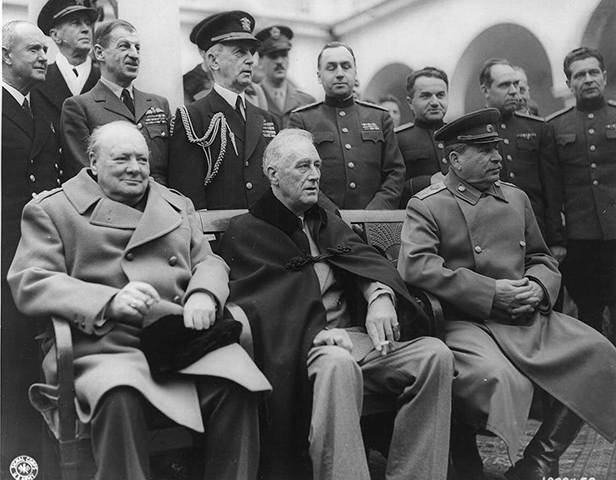 Historic photographs of the three world leaders at that conference show Admiral McCrea standing directly behind the president. To assist in my story the veteran affairs director acquired some photos of the admiral from naval archives. To get this story I needed to arrange a telephone interview. Before I made the call I carefully thought out all of the questions I wanted to ask, based on all of the things I already knew about McCrea’s career. When the time came to call McCrea, I was so nervous my hands were shaking. I was hoping my voice was steady. After all, I was about to talk to a once very powerful naval figure who served our nation during two great wars. I was sure he would have a great story to tell if he agreed to an interview. As I remember, I made contact on my first call, but McCrea asked for time to prepare for the interview and think about what he was going to say. We made an appointment for a second call a few days later. Thus the nerve machine was allowed to run at full blast for yet another two or three days. It was among my most memorable interviews and stories written during my newspaper career. McCrea told me about growing up in Marlette; the son of a local physician who was so spoiled as a child that he didn’t take life very seriously. He said he didn’t apply himself in school and graduated near the bottom of his class. His father had to pull some political strings to get him admitted to Annapolis Naval Academy in 1915. Once he decided to get serious about his education, however, McCrea said he excelled in scholastic achievement, eventually earning a degree in law. He went to sea and saw action in World War I. His achievements in naval service and his high marks in education gained the attention of President Roosevelt. He also rose quickly in rank to the level of admiral. McCrea told how proud he was when Roosevelt honored him by asking him to serve as his aide in Washington, and then giving him command of the Navy’s newest and most powerful battleship, the Iowa. During the secret trip to Malta and Cairo, McCrea said the Iowa was accompanied by a fleet of destroyer escorts, all of the vessels following the standard zigzag course to make it hard for a submarines to attack them with torpedoes. Careful assurances were made to make sure the Germans did not know President Roosevelt was on board that battleship. An incident occurred about mid-way across the Atlantic that was not told until after the war. It seems that the destroyer escorts were conducting torpedo drills during the trip. During one of the drills one of the crew members accidentally fired a live torpedo and it was headed right for the Iowa. The skipper of the destroyer reported to the Iowa and McCrea took decisive action. He ordered the ship turned directly toward the oncoming torpedo. The turn was completed just as the wayward torpedo passed within a few feet of the battleship. McCrea had other interesting war stories to include in that interview but I have forgotten them. I believe Look Magazine reported the torpedo mishap in a publication after the war ended. McCrea was suddenly a national hero for saving the president from any harm that day. Admiral McCrea later served as deputy commander-in-chief of the Pacific Fleet and as commandant of the First Naval District in Boston before his retirement in 1953. I found him clear headed and a fun interview once I got over my first stage of nervousness. McCrea died a few years later at the age of 98.